With Man Mosh I and II, (which we could not have done without generous performances from Living Colour, 24-7 Spyz, Ronny Drayton and Reverend Kim Leslie, Nona Hendryx, Burnt Sugar, DJ Afrika Bambaataa, The Sugarhill Gang, and others), we were able to bring folks together, call attention to the issue of unjust incarceration, and help raise money for Donovan Drayton’s Legal Defense Fund (glad he’s finally home!). 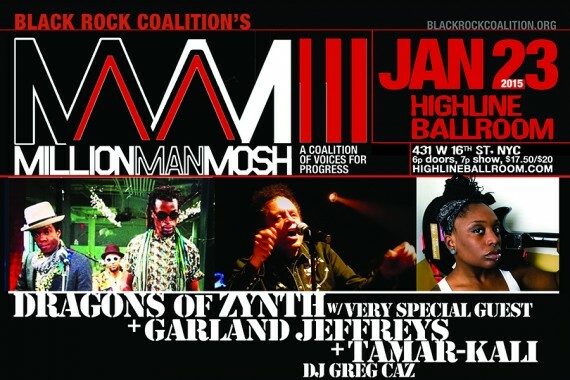 With Million Man Mosh III, we continued the spirit of community-building and action-taking with performances from the very-vocal Tamar-kali, Garland Jeffreys, and Dragons of Zynth with Saul Williams. This time, the focus was on policing and the need for loud and progressive voices for change.